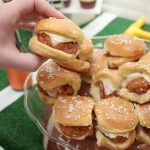 Buffalo chicken sliders made with boneless buffalo wings, provolone cheese and ranch dressing. Spread ranch dressing on the inside of each roll, top and bottom. Place one piece of chicken and one piece of cheese inside each roll. Press roll together and put all rolls in a casserole dish (it may take more than one dish). Melt butter and mix in sesame seeds. Spread butter mixture over rolls. Cover with aluminum foil and bake for 10 minutes then remove foil and bake for another 5- 10 minutes. **If you make these a day ahead of time assemble the sliders and stop at the butter step. Store in the refrigerator overnight and before baking brush the rolls with the butter mixture. You may want to add 5 minutes to the cooking time to make sure the chicken gets warmed all of the way through.